NASA's Cassini spacecraft captured this image of Saturn, its rings and the moons Mimas, Janus and Tethys on March 13, 2006. Tethys is below the ring plane, Mimas is above it and tiny Janus appears to sit right on the rings in this view. NASA and the Cassini team have given us another gorgeous blast from Saturn's past. The Cassini spacecraft orbited Saturn from the summer of 2004 until Sept. 15, 2017, when the low-on-fuel probe performed an intentional death dive into the ringed planet's cloud tops. The satellite Tethys is below the rings, Mimas is above them and tiny Janus appears to sit right on top of the ring plane in the photo, which Cassini took at a distance of 1.7 million miles (2.7 million kilometers) from Saturn. "'Above' and 'below' the rings is mostly a matter of perspective here. 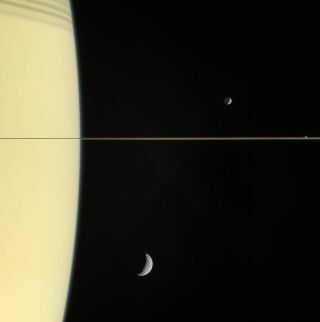 All three moons and the rings orbit Saturn in roughly the same plane," NASA officials wrote in an image description. "The night side of Mimas is gently illuminated by 'Saturnshine,' sunlight reflected from the planet’s cloud tops." Tethys is the largest of the three moons in the photo, with a diameter of 662 miles (1,066 km). It has a crater, called Odysseus, that’s about as large as Mimas, which is 246 miles (396 km) across. Janus is considerably smaller, with a diameter of about 112 miles (180 km). Mimas, by the way, is often called the Death Star moon, because one of its big craters gives the icy, battered satellite a striking resemblance to the superweapon in the "Star Wars" films. The $3.2 billion Cassini-Huygens mission — a collaboration involving NASA, the European Space Agency and the Italian Space Agency — launched in October 1997 and arrived in orbit around Saturn on June 30, 2004. Huygens was a European lander that rode piggyback with Cassini and eventually touched down on the surface of Titan, Saturn's largest moon, in January 2005. This was the first soft landing ever achieved on a body in the outer solar system.